CEDAM member Jefferson East, Inc. (JEI) has been a catalyst for community economic development in the five neighborhoods they serve along the east Jefferson corridor in Detroit since 1994. From the East Jefferson Development Corporation to their Clean and Safe program, the organization does a lot to empower its residents and invest in the community. They’re continuing to do so by helping Detroit residents save on property taxes. You may know JEI for being an intake center for the Detroit 0% Interest Home Repair Loans Program, which allows Detroiters, regardless of neighborhood or if you’re low-income, take out 0% interest loans for correcting health and safety hazards and other projects such as electrical repairs, furnace replacement, roof replacement, plumbing, door and window replacement, restoration or maintenance as well as porches and structural support. This program helps make homes safer and is an important resource that allows many to stay in their homes. JEI is also connecting residents to another important housing resource. September through December, JEI is offering Property Tax Exemption Workshops. 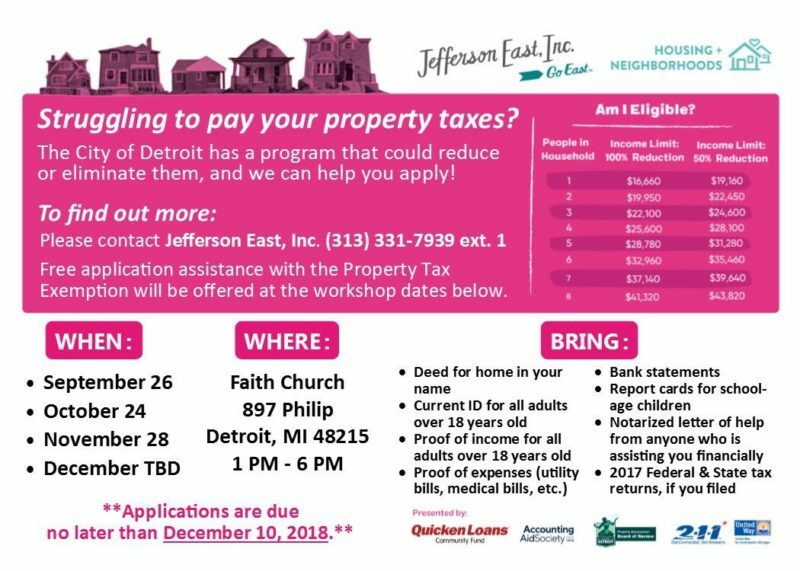 At the Workshops, they’re helping homeowners apply for a City of Detroit program that could reduce or eliminate 2018 property taxes. The workshops are held every fourth Wednesday of the month at Faith Church located at 897 Philip, Detroit, MI 48215. Those interested can walk-in from anytime between 1-6pm to receive assistance with the application, which is due December 10, 2018. Those who are unable to attend a workshop can schedule a one-on-one appointment at their satellite office. For more information about Jefferson East, Inc. visit their website or call them at 313.331.7939.